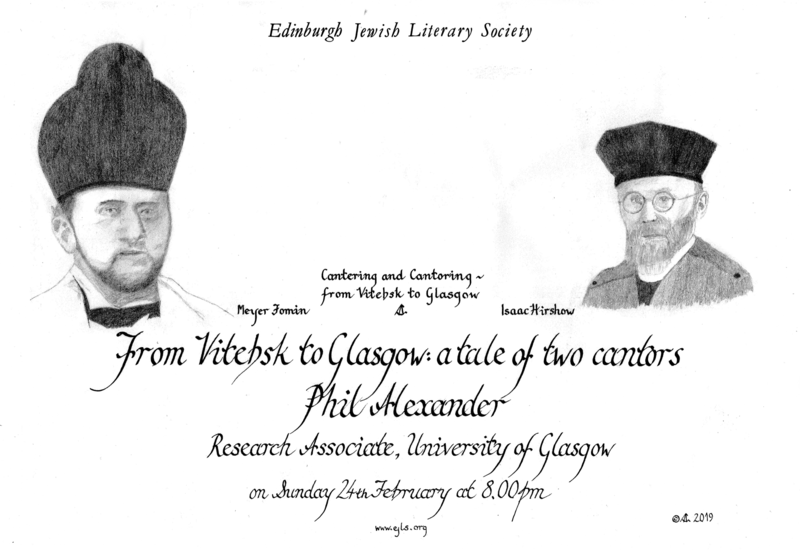 Phil will talk about two important figures of Scottish Jewish music: Meyer Fomin and Isaac Hirshow. Both men were born in Vitebsk in the 1880s, both trained in Warsaw, and both moved with their families to Glasgow at the beginning of the 1920s, where they would remain for the rest of their lives. The first part of this talk will concentrate on these two cantors as part of early 20th century Eastern Europe’s lively Ashkenazi musical life, where their careers spanned liturgical music, Yiddish song and classical performance. We will then listen to and discuss some of their work upon arriving in Scotland, looking at how much this musical material represents the East of their birth and training, and in what ways it reflects their new immigrant identities. Phil Alexander is a Research Associate at the University of Glasgow, working on the ‘Jewish Lives/Scottish Spaces’ project. He has published articles on silence in Berlin and salsa in Scotland, and is currently completing a monograph exploring the diversity and complexity of Berlin’s contemporary klezmer and Yiddish music scene. He is also a busy musician, leading the acclaimed band Moishe’s Bagel and performing regularly with many of the UK’s finest folk and jazz musicians.